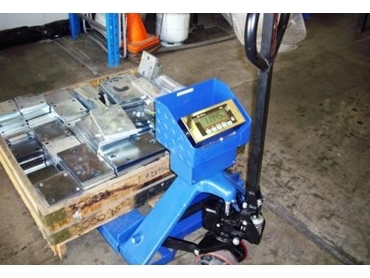 Pallet Jack Scales were recently modified to enable use in a hazardous area at a Sugar Mill in North Queensland. Supplied by Accuweigh’s Brisbane branch, the Pallet Jack Scales were fitted with load cells and an Intrinisically Safe (IS) digital weight indicator. Hazardous Areas Pallet Jack Scales enables products to be weighed within a restricted area. The portability of Accuweigh’s Hazardous Areas Pallet Jack Scales saves considerable time and effort in weighing product within a designated Hazardous Area. The Rinstrum 2100EX digital weight indicator fitted to Hazardous Areas Pallet Jack Scale is certified for use in Hazardous Areas and is powered by a rechargeable battery pack mounted in a sealed compartment in the pallet jack’s headstock. The battery is fitted with specialised charging connections to ensure the battery can only be recharged by the supplied battery charger which is stationed in a safe area away from the Hazardous Area. Accuweigh is Australia’s largest industrial weighing company with eight branches covering all mainland states to provide sales and service support on all types of scales, including Intrinisically Safe Indicators and Hazardous Area Scales and weighing equipment.